the president to receive their copy of the e-newsletter and e-yearbook. September through April contests will be held for dues-paying members. Includes unpublished poetry and unpublished prose, fiction or non-fiction. Only one submission in each category per month. Entries must relate to the monthly prompts (listed below). Prose is limited to 500 words, double spaced; poetry is limited to two typed pages, single-spaced with double spacing between stanzas. Entries are judged blind by the month’s guest speaker. Submit two documents. First is the entry with no author information. Second is a one-page cover sheet with author’s name, category noted as poetry or prose, title, first two lines, and word count for prose. NOTE: prose entry cannot be judged if the word count is not on the cover sheet or exceeds 500 words. Prizes awarded for both poetry and prose: $10 for first place, $5 for second place, no cash prize for Honorable Mention. All winners are asked to read their winning entry. 1. 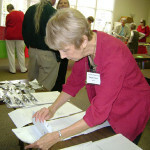 Bring entry to the meeting and give to Barbara Lassiter, Contest Chair, before the meeting starts. NOTE: The Pensters and the Contest Chair assume no responsibility for lost, late, undelivered or misaddressed entries. Late entries will not be judged. To view all recent articles and member interviews click here. At the April 2016 meeting after a months-long application and selection process, Scholarship Chair Barbara Lassiter awarded a certificate and $1000 check to Miss Hannah Denham a graduating senior of Daphne High School. Denham, who began writing poetry around age thirteen “to find her own voice,” shared a few pieces of her work for those in attendance. The one-time poetry scholarship was established by the membership to honor our recent past president and treasurer, P.T. Paul-Sampson and Satch Sampson, a husband-wife duo who have given many years of dedicated service in leadership roles to The Pensters Writing Group.